The string orchestra will present a concert of music written or arranged by it’s members. More details regarding the program will be shared as the performance date approaches. Performing Karl Evangelist’s music with Margaret Rei Scampavia Evangelista, Jordan Glenn and Cory Wright. Attending a female-identifying artist retreat, On Beauty, in Point Arena, CA with members and non-members of the CCA faculty. Recording with Nathan Clevenger at New, Improved Recording Studio in Oakland. I will be performing SOLO. Also performing: Virtual Balboa (Philadelphia), Dancing Baby (Bay Area). The string orchestra will present a concert of music written or arranged by it’s members. A composition I wrote for this ensemble will be performed. Outgrowth (2018) is for string nonet. Paul Kirchner has generously offered his workshop for us to host. Please stop in for a lovely evening of chamber music. Music by Myra Melford for four improvisors (Myra, Jordan Glenn, Darren Johnston, and myself) and four members of the Berkeley Symphony. Four Season's Arts Presents: Thomas Bruckner "Music of Living Composers"
Crystal Pascucci will perform Ashley Fure's work, Wire and Wool, for solo cello and live electronics. Mark Clifford's Dirty Snacks Ensemble will be at the Ivy Room every first Wednesday for 3 months, November-January. He's invited members of the 7-piece ensemble to also write for the ensemble. We will play one long set from 9:45pm-11pm. Inner Movements (https://www.innermovements.org/) is a collective of percussionists and string players celebrating the music of the 20th, 21st centuries and newly commissioned works. Mark Clifford and Crystal Pascucci will present celebrated and original works. ALSO PERFORMING: Ben Goldberg Group; Jordan Glenn (solo); Fred Frith, Nava Dunkelman, Gabby Fluke-Mogul; David Molina's Transient, Featuring Loach Fillet & special guest, Secret Sidewalk, Adams - Boisen - Rowe trio; Prism, William Winant meets The Hung Professionals. Pete Smith will be sharing records between groups. Crystal Pascucci, Vijay Anderson (drums) and Steve Adams (saxophone) will perform as a trio. The evening is dedicated to woman band leaders. Sharing the bill is Alison Niebedalski and Beth Schenck. Mark Clifford's Dirty Snacks Ensemble will be at the Ivy Room every first Wednesday for 3 months, November-January. He's invited members of the 7-piece ensemble to also write for the ensemble. We will play one long set from 9:45pm-11pm. Members include Mark Clifford (vibes and compositions), Bob LaDue (percussion), John McCowen (clarinets), Steve Blum (keys), Crystal Pascucci (cello), Scott Brown (bass) and Geneva Harrison (drums). Mark Clifford's Dirty Snacks Ensemble will be at the Ivy Room every first Wednesday for 3 months, November-January. He's invited members of the 7-piece ensemble to also write for the ensemble. We will play one long set from 9:45pm-11pm. Members include Mark Clifford (vibes and compositions), Bob LaDue (percussion), Patrick Roth (vocals), John McCowen (bass clarinet), Steve Blum (keys), Crystal Pascucci (cello), Scott Brown (bass) and Andrew McGuire (drums). 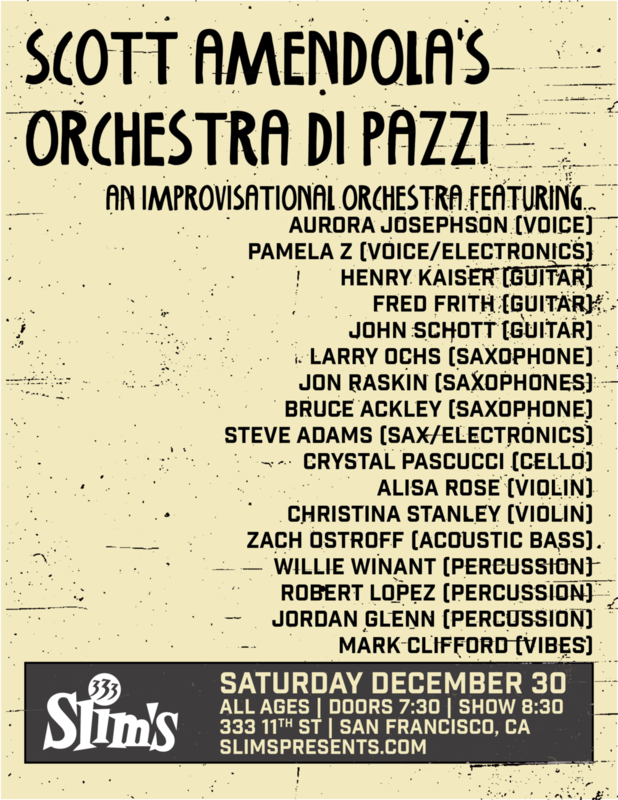 Scott Amendola's Orchestra Di Pazzi! @ Berkeley Arts Museum! Featuring: Aurora Josephson, Fred Frith, Crystal Pascucci, Zachary James Watkins, and many more!